Growing up as a middle child is difficult. First born children get lots of attention because for a while at least they are an only child. The youngest get attention and are pampered because they will always be the "baby" of the family. But what about the middle child? Jesse adored his big brother Roscoe but Roscoe was not thrilled at having a baby brother. After all he was the one getting lots of attention from Mom, Dad, Grandparents and other family members. Jesse followed Roscoe everywhere and eventually they became friends ... sort of. Then along came baby sister Alicia and it was all over for both of them. Being the only girl, Alicia stole the attention from everyone. The three of them got along about as well as any siblings get along. Roscoe had friends - lots of friends and Jesse wanted to hang out with Roscoe and his friends. But Roscoe was a bit older and did not like having a little brother following him everywhere. It made Jesse sad to be left out and being left alone. But Jesse had a good heart and those who paid attention could see him as a good friend. "Hey *waves* This is me - Jesse and I came here to make a few friends, have a few laughs and just be me. Looking forward to seeing y'all soon *smile*"
Jesse was created by using one random roll. The wardrobe is mostly his choice with only a few minor alterations. 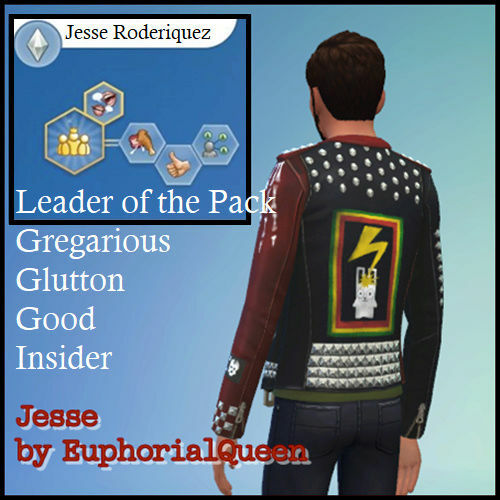 Jesse was created using random roll to decide his aspirations and traits. 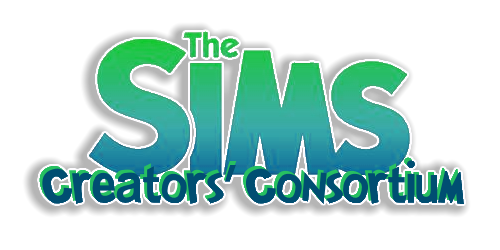 The idea of the challenge is to complete at least one aspiration in each of the aspiration categories currently available in game. Using this list to track progress. 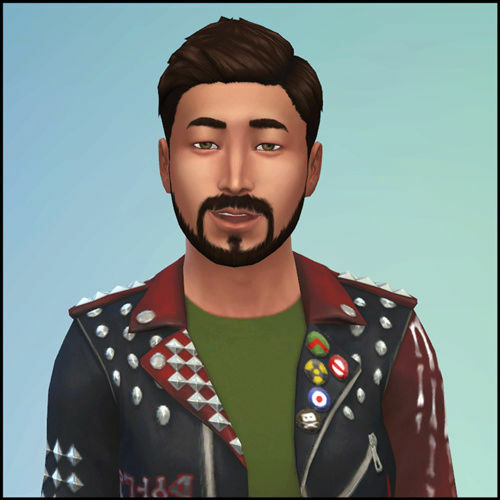 Jesse loved his family but he also wanted to meet new people and be on his own. 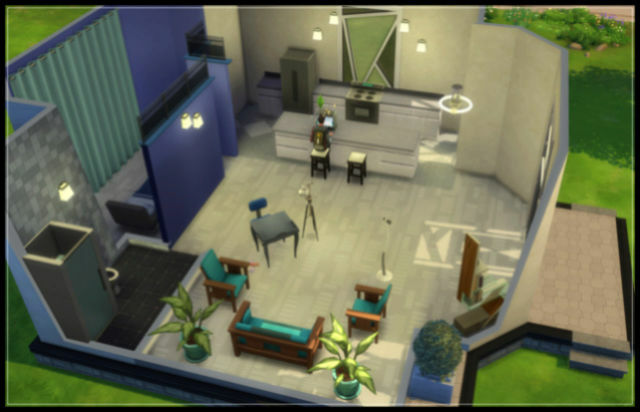 So he took his graduation money and hopped on a bus to San Myshuno to find his very own apartment. 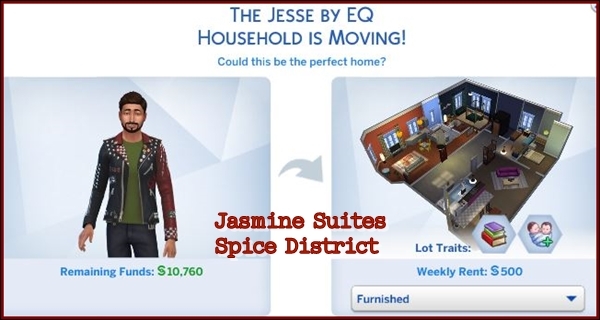 He found a nice one in Jasmine Suites in the Spice District. It was slightly above what he wanted to spend but it was clean and the neighbors seemed nice. And best of all the Spice Festival would be right outside his door. For a first apartment this was much better than he expected. And best of all there were people - lots of people out in the square at all hours. The first thing Jesse wanted to do was to do volunteer work. So off he went to volunteer at a local Nursing home. It felt good to meet the Seniors living there. They shared lots of fascinating stories of their lives in places like Twinbrook, Riverview and Sunset Valley. Jesse hoped he could go back again someday or even do volunteer work at other places. A very eventful beginning for you and Jesse. All that in the first 10 Sim Days. 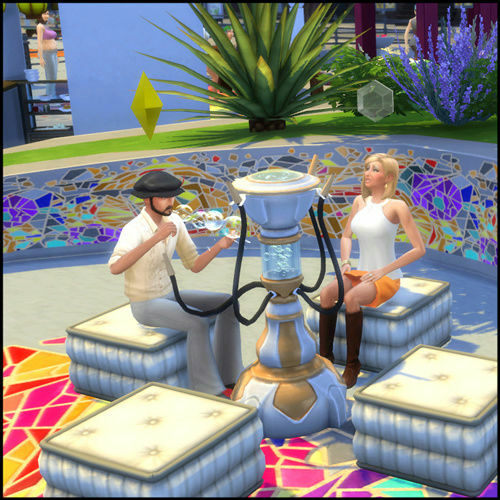 This reminds me of your Sims 3 story. The family you used to play thru all the aspirations in that game. Looks like he is off to a fun start! 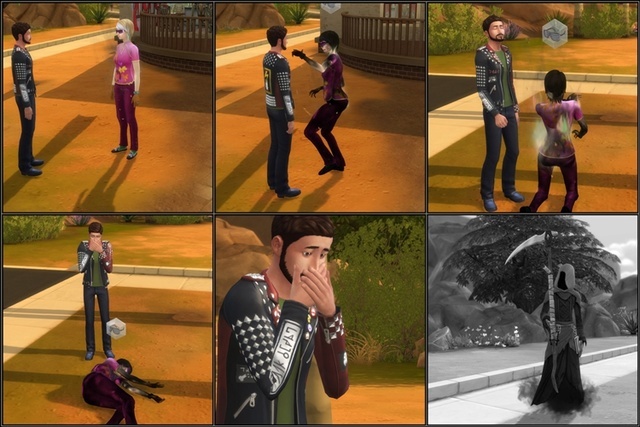 The mourning man/woman made me laugh. 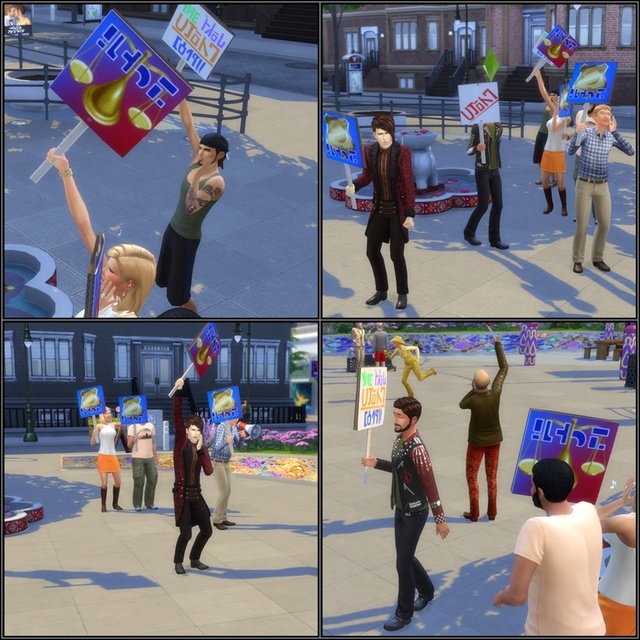 It's funny when sims try and stand in the same place. I was laughing so very hard when I saw that. It really cracked me up but luckily I had the presence of Mind hit the pause button so I can catch some screenshots of it. 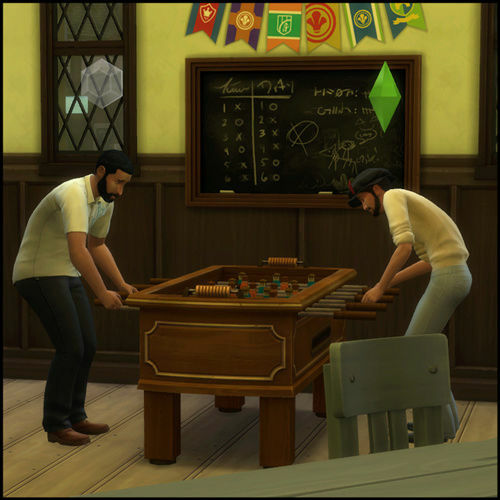 The whole reason for moving Jesse into an apartment was to work on the City Native aspiration. Having completed the mural I was glad to see the notice for the Romance Festival. Found someone to kiss and it was marked as completed. The was still time before the end of the festival so I switched to Friend of the World. I needed to "Have 12 Friends" and only needed one more. That was when things went awry. Jesse had been invited to go to the festival with Bob Pancake. 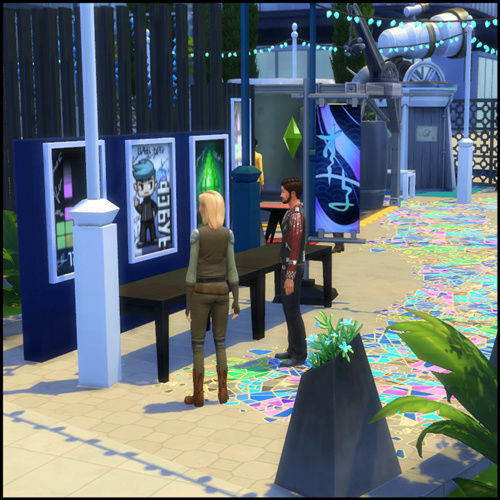 I waited until the festival stuff disappeared before leaving. When Jesse got home it was after Midnight. Then a notice popped up from Bob Pancake asking Jesse to go to the festival. I cancelled it and that was when I noticed my friend count dropped from 11 back to 6 where it was before the festival. 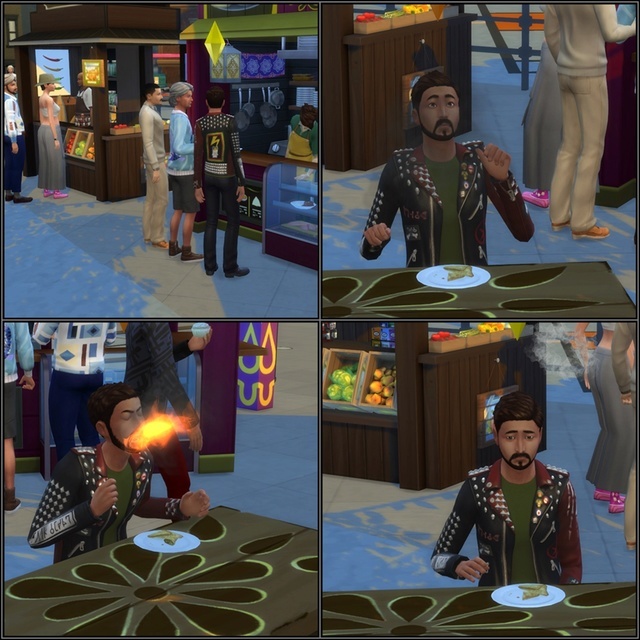 Looked at the City Native aspiration and "Kiss Someone at the Romance Festival" was no longer completed. No idea what other progress I lost. Oh my but you do seem to have more than your share of problems. Not as many as some. I could just use cheats to move forward. But I was trying not to do that in this save. At least I have learned a lot of trouble shooting techniques over the years. I share these things here in case someone else has the same problem and maybe I can help them. Jesse was excited to live in the city but decided it was time to move. The neighbors were making all kinds of noise at all hours. All Jesse did was sing in the shower and they would come pounding his door down. Fun Fact: I was building on Potters Splay to make a place to move. 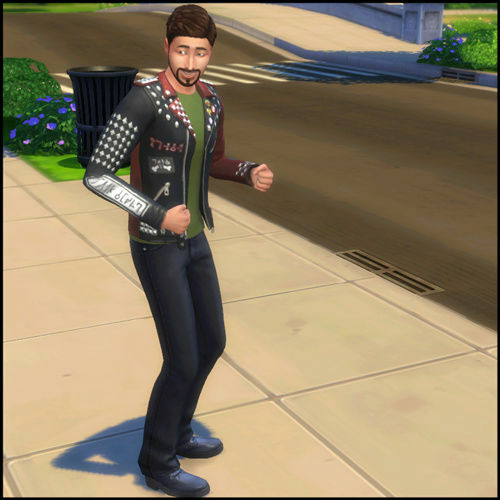 I do not remember the last time I had Sims live in that area. 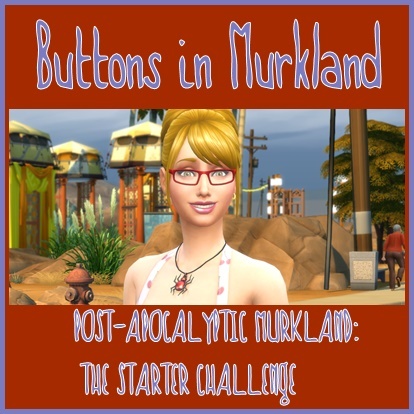 As I was putting on a few finishing touches I saw the notice that BG had posted her let's play on YouTube. Imagine my surprise when she had placed her family on ... Potters Splay. Cute story. But sorry about your game problem. Very disappointing to have that happen. Loss of progress is never fun. 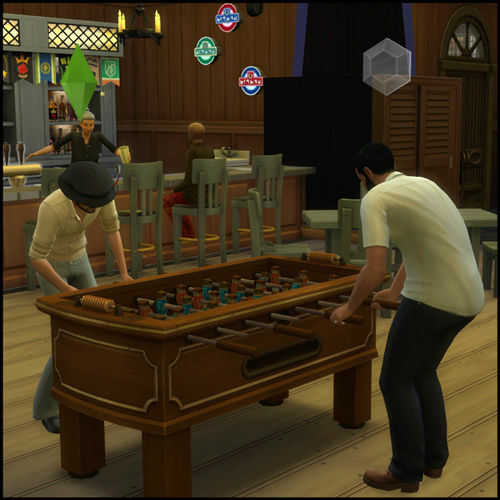 Maybe Jesse will have more luck in Oasis Springs. 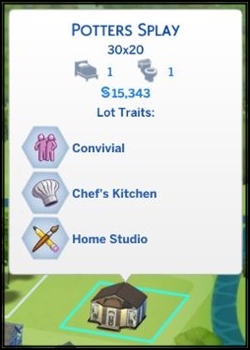 Jesse has been a busy Sim. 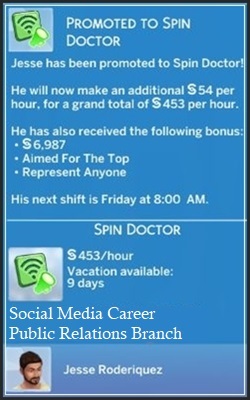 He joined the Social Media Career in the Public Relations Branch and was just promoted to Level 10 Spin Doctor. Interesting turn of events. 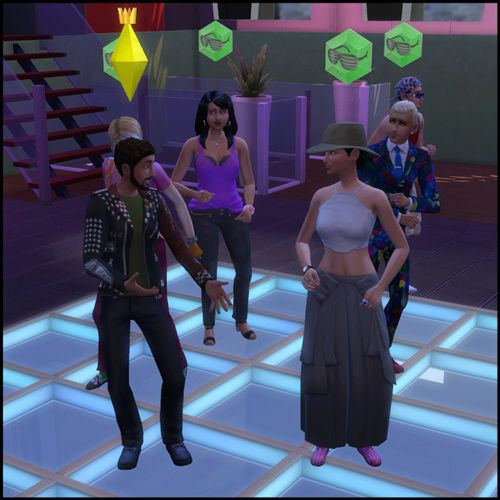 Jesse has been talking with a wide variety of Sims but has not been flirty. 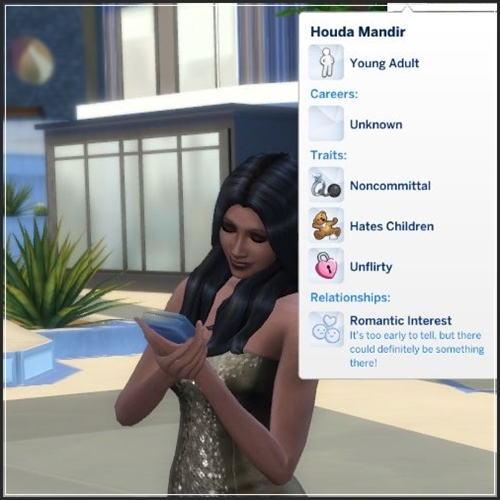 For some unknown reason his "Enchanting Introduction" was not rejected by Houda. After a bit more conversation and light flirting he learned she is Noncommittal, Hates Children and ....... Unflirty! And yet she was more than happy to exchange numbers.